The new concept and its eventual production version isn’t just some electrified version of an existing model but rather rides on an all-new architecture designed from the ground up for EVs exclusively. It will serve as the basis for a host of new Infiniti EVs. One of the more refreshing things we like about the Qs Inspiration is the fact that it’s a sedan, as opposed to yet another crossover. What’s more, it’s a traditional three-box design featuring new exterior proportions and a more spacious, lounge-like interior. The design effort was led by former BMW designer Karim Habib, who was recruited to Infiniti a couple of years ago. Think of this as a new take on the sedan for the 21st century all-electric era. It incorporates Infiniti’s new form design language that will be seen on future EVs. Japanese design DNA also played a huge role. With its elevated ride height and stunning surfaces. 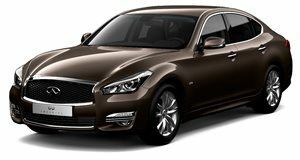 Infiniti previously announced the production version will be manufactured in China for that specific market. We don’t know yet whether or not it will be exported to the US or sold here at all. But why China? "China has the most growth potential for electric vehicles globally, especially in the premium segment,” said Infiniti chairman Christian Meunier. Unfortunately, the automaker has not revealed the concept’s power output or anything else related to batteries and an electric motor. The only hint offered is that Infiniti "will offer electric and e-Power powertrains across its lineup” in just a few years’ time. It will be interesting to see how much of this concept makes it to production, but Infiniti knows it needs to produce something to stand out from the pack, which will include the production version of the Audi e-tron GT, Porsche Taycan, and the Tesla Model S.